The fees for the design of your web site tailored to your requirements and from graphics you supply, tends to start from £300. As a rough guide, a small brochureware site with basic graphics and simple code may cost around £300, and a larger site with more complex graphics and code covering around ten pages of services may cost £1,000 or more. What do we need from you in order to produce a quote? Any plans, rough sketches or anything else if you have an idea as to what you want the site to look like. How does the work proceed once you have accepted our Quote? We start by designing your home page. The look and feel of this page is the most important because it is the page a user will see when they first land on your site. If a user likes your home page - it looks good, loads quickly into their browser, efficiently tells them what you do and is easy to navigate - it will encourage them to look at the rest of your site rather than browse to a competitor's site instead. This is why at didilogix.com we try to get this page right first! It is for this stage that we will refer to your stationery and marketing materials in order to ensure that the look and feel of the page complements your corporate image. We will be asking for artwork too at this stage (e.g. company logos, diagrams and other existing artwork you may have) to incorporate in your site. When we have some drafts of the home page (each draft of which may look slightly different) we will send you credentials in order that you may logon to our "Client Zone" to view the drafts, or we will e-mail or post you screenshots - whatever you prefer. You then choose the draft you like the best and advise us of any changes you'd like to see to it. We will then implement the changes and submit what we term the "first iteration" for your review. Once we have made the changes you specified we move	on to step 2 below. Please note, where we have quoted less than £500 for the design of your site, two such iterations are included in the fee. For web sites costing £500 or over, we include three iterations in the fee. For web sites costing £1000 or over, we include four - or more at our discretion iterations in the fee - and so on. Once you are happy with the look and feel of your home page, we will then design one of the pages that will be linked to via that home page. This could, for example, be a page that covers one of your products or services and it will be designed in order to complement the look and feel of your home page to ensure a consistent corporate image. The approval process will follow the same procedure as for the home page described above. Once you are happy with the look and feel of the service or produce page, we then design the rest of the pages based on the look and feel of that page. We will then upload the entire site to our "Client Zone" for your comments and approval. Once you approve the site, we will upload the pages and associated files to a web server of your choice (or provide the files to you on disk). We will validate that the web site works across the most popular browser platforms (e.g. Internet Explorer, Opera, Netscape, etc) and submit the domain name to the most popular search engines in order to publicise that your web site exists, and that's all there is to it! Some clients prefer to meet with us to review their pages - or the entire site - so we can make changes in front of them so they can see exactly what a change looks like (usually for changes such as "try using x colour for this font and see if it looks better". An hour of such a meeting may be provided free of charge at our discretion (e.g. if it replaces one of the iteration processes or you are paying us over £1000 in web site design fees). Some clients want to meet with us anyway. 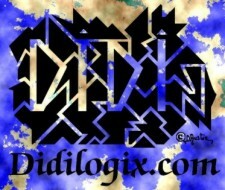 This is no problem as almost all things are negotiable at didilogix.com! For an extra sum, we can design images/animations for inclusion on your web pages, or amend manipulate your existing graphics (in more complex ways than changing backgrounds and resampling as this type of manipulation is included in the fee). We use Adobe Photoshop and Corel Draw, amongst other applications. We have much experience in designing exhibition stands and marketing materials and can help you design these in such a way as to complement your web site - or vice versa! Want a fancy sounding dotcom to go with your fancy new web site? Or just want a domain name anyway? We can arrange this for you for fees that can be as little as £10.00 per annum per domain name. If your web design	fees with us will be more than £500, we will register one domain name of your choice for a year for free - you will just need to pay as little as £10.00 each year for future years thereafter. Don't have your own web server on which to put your web site? No problem. Our partnership with Pair Networks means we can charge you as little as £3.00 per month for web hosting on top of an intitial set up fee of around £20-£50 depending on your requirements. Want to have e-mail addresses that correspond to the domain name you have chosen, such as "info@yourdomainname.com"? If you host with us, we can provide this for a one-off fee of £20.00 for the first mailbox (e-mail account) and £3.00 for every mailbox thereafter. If you require us to come to your site to help you configure your e-mail software	then we can do this too for an additional fee which we can quote you based on the number of users that will need to be set up. A web site is only as good as the people that know about it! We submit your web site to various search engines as part of the web design fee. However, type in "penetration testing" into Google and you'll see a load of ressults, but at the very top you'll see a web site called "First Base Technologies" - who are one of our clients. The reason they come right up the top? Because they pay for it! How to get your web site right up the top like "First Base Technologies"? Set up a load of keywords on the Google Pay-Per-Click™ interface along with a few words of advertisement, set up how much you want to bid for them, check it all works, then monitor it regularly to make sure that a competitor hasn't outbid you on that keyword resulting in their web site appearing higher than yours. Well, that's the gist of it. We can set up your Google Pay-Per-Click™ campaign and manage it for an initial fee that depends on the number of keywords you want set up and a quarterly fee for keeping an eye on it. Need an example? First Base Technologies mentioned above have around three hundred keywords for all their different services along with various different adverts to go with the categories of keyword. The initial set up cost was around £200 and it costs about £50 per quarter to check the bids, change entries and update the managing spreadsheet etc. The fees for the keywords themselves are in addition, and are paid direct to Google™ - you will of course receive invoices and receipts for those payments (including VAT) from Google™. This service could be termed an "after sales care" service and covers web site maintenance such as updating your web site with new textual information where the overall layout or structure of the web pages do not need to be changed. We tend to charge about £30 per hour at time of writing (depending on the complexity of the changes necessary). Where you wish to schedule more regular - say quarterly - updates, we can quote for this at a discounted rate. We can also provide consultancy and skills transfer to show one of your own team how to update text on the web site. If you need more radical changes to web pages at any time after the initial work constructing the site has been completed - such as a bit of an overhall of look and feel - we charge based on a percentage of the fees we originally charged for constructing your original web page or site (the percentage used calculated in proportion to how much of the web page or site is being altered and the skill involved in making those changes). The initial consultation process to discuss your requirements prior to commencement of building the site is free of charge. For any additional consultancy, if the consultation time above involves training, skills or knowledge transfer (such as training a staff member in webmastering skills) then the fee for this will be at our "training" rate, depending on the nature of the training/skills transfer involved. We undertake, or can arrange, training in a variety of IT skills, primarily Internet and Web skills, as well as web site design skills and know-how. Details are available upon request.